Universe Mini Black Holes - Universe Galaxies And Stars Section. Mini black holes litter the early universe. Universe swarmed with mini black holes. Famed Astronomer Sir Martin Rees, and a team of Astronomers from Cambridge in UK believe that the early universe swarmed with miniature black holes. They believe that these smaller objects formed early and then merged together over time to create the supermassive black holes that now lurk at the centres of galaxies. Recent observations of the cosmic microwave background radiation shows that the universe warmed up when the it was 400,000 years old, which could have been because of matter heating up around these mini black holes. A research group at Cambridge think that the universe might once have been packed full of tiny black holes. Dr Martin Haehnelt, a researcher in the group led by Astronomer Royal Martin Rees, will present new evidence to support this controversial idea at the Institute of physics conference physics 2005 in Warwick. 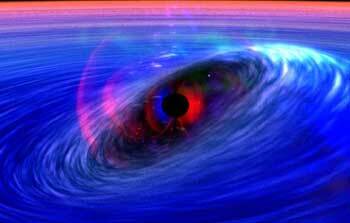 Most Cosmologists believe that supermassive black holes grew up in big galaxies, accumulating mass as time went on. But Haehnelt says there is increasing evidence for a different view – that small black holes grew independently and merged to produce the giants which exist today. Haehnelt points to evidence from recent studies of the cosmic microwave background (CMB). This radiation, sometimes called "the echo of the big bang" has been travelling unaltered through space since the universe was just 400,000 years old. At that moment the universe cooled through a critical point, letting CMB radiation travel freely for the first time – as though a cosmic fog had lifted. But new evidence shows that 10 to 15 percent of this radiation has been scattered since then. This indicates a re-warming of the universe which nobody had expected. Haehnelt explains that this could indicate an era in which small black holes were commonplace. "Matter accreting around a black hole heats up," he explains, "and this heating could be a sign that small black holes were widespread in the universe at that time." If small black holes merged to form the supermassive variety found at the centres of galaxies, there could be telltale evidence. Such a merger begins with two black holes going into orbit around each other, spiralling ever closer together. In the cataclysmic blast of energy when they finally merge, any asymmetry can send the resulting black hole flying off into space. "If this happened," says Haehnelt, "we might find the occasional Galaxy with its central supermassive black hole missing." The evidence is by no means conclusive. Until it is, the CMB results will remain a source of heated debate. Dr Martin Haehnelt is a Reader in cosmology and Astrophysics at the Institute of astronomy in the University of Cambridge.